Hundreds of thousands of people plopped down $1,000 over a year ago to reserve a spot on the Tesla Model 3 production list. They were told, upfront, that they shouldn’t expect the car before the end of 2018. And still no one knows when they’ll be receiving their orders. They’re now looking for answers, according to a report today from Bloomberg. The lack of information received from Tesla “makes me 100 percent more nervous,” said Patrick Herrity, a 34-year-old business consultant in Virginia who made his Model 3 reservation online. He said he understands the company is being secretive to ward off competitors but hopes this week’s event will shed more light on his next ride. What Herrity wants is a fully-loaded Model 3 with all-wheel drive and a sunroof — options that won’t be available in the first cars to roll off the assembly line in Fremont, California. Musk has said the Model 3 will initially be built with the simplest design, unlike the feature-heavy Model X sport utility, which was plagued by early production problems. My studious colleague Justin Westbrook has written about the uncertainty of the Model 3's interior for weeks, so it’s not exactly a surprise that some reservation holders are growing wary. What’s more, Bloomberg notes, the car could get pricier for those further down the list of reservation holders. The U.S. begins to phase out the $7,500 federal tax credit buyers receive for purchasing electric cars once each manufacturer has sold 200,000 vehicles. Tesla likely will cross that threshold in 2018, according to Bloomberg New Energy Finance projections. 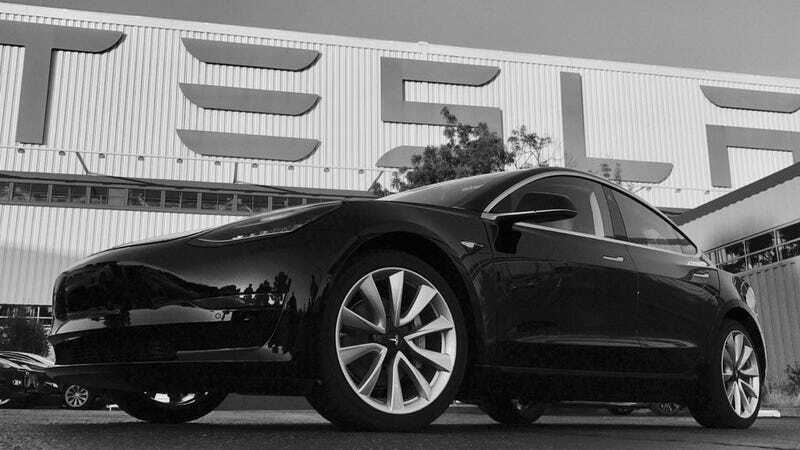 Tesla hopes to produce about 20,000 Model 3s by years-end, per guidance previously issued by Musk on Twitter (of course), so that aforementioned estimate from Bloomberg would seem right; if Tesla hits Musk’s goal of producing 500,000 cars by the end of 2018, it could happen far sooner. I’m just interested in seeing how many people put down a reservation now, knowing they might not get the car until 2019. If you’re a Model 3 reservation holder, I’d love to hear from you. You can reach me at ryan.felton@jalopnik.com or find my contact info here.